Zak Butters is an underrated draft option who is expected to land somewhere in the first two rounds, despite a season-ending shoulder injury that he sustained in the National Under 18 Championships. Butters impressed the championships, picking up 15 disposals, having three inside 50s and laying four tackles against Vic Country on the MCG, as well as 19 disposals and five inside 50s against the Allies and 17 touches against Western Australia. Butters is a smooth mover who has a neat sidestep that he uses to get out of trouble, because he has a light frame that still needs to be developed in order to impact one-on-one. He is good overhead with great speed and agility, as well as excellent vision. It was on show throughout the championships and TAC Cup for the Western Jets, when he is able to identify a teammate out in space 20m away. He does need to bulk up to impact more on the inside of the contest, and sometimes can loop his handballs a bit much, but his disposal by foot is generally solid, although his decision making can be improved. 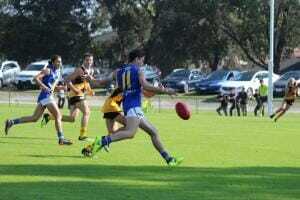 Overall he is a very nice prospect who will likely find a home in the first 30 picks of the AFL National Draft. Butters is an exciting player who has all the athletic traits that are likely to interest recruiters in the top end of the draft. Not too dissimilar to a fellow Western Jet, Jayden Laverde from a few seasons ago, Butters is a forward half player who can play through the midfield. Butters is very quick – recording a 3.015 second 20m sprint in the pre-season testing, and his agility test was just as impressive, running it in 8.184 seconds. The most noticeable trait about Butters is his ability arch the back and be nimble enough to avoid a tackle, or if he does cop a tackle, have the composure and vision to spot up a teammate and execute a handball to a teammate on the outside. Butters oozes the X-factor that few players have, and when in possession you just know something creative is going to happen. While sometimes he can make mistakes by foot, he often goes for the more damaging kick to hurt the opposition and can produce that 45 degree kick towards a teammate to break up the zone. His ceiling would be as high as most in the draft, with his frame to still fill and a tank to build on. When you watch Butters you can appreciate what he is trying to do with each possession, even if it does not always pan out the way intended. If you watch him during the National Under 18 Championships, you can see when under pressure at a stoppage he is able to have a split-second glance laterally and handball into space where his teammate on the outside is running to, so while he is not an inside ball winner, he is not afraid to go in and pluck out a loose ball and feed the ball to a teammate who is running past. Butters is one of the few players whose improvements can be easily worked on at AFL level. Naturally he has a light frame, weighing in at just 70kg in the pre-season, and therefore he cannot play much inside against the bigger bodies, thus impacting on the outside or up forward. But once he can put on more muscle he will still have the athletic attributes and smarts to be able to win it on the inside and hurt his opponents on the outside. Going hand in hand with his strength needing to improve, Butters can still build his endurance base to become more of a full-time midfielder. He mentioned in the pre-season it was a goal of his, recording a 20.1 in the Yo-Yo test at the TAC Cup testing, and unfortunately for the exciting mid/forward, his season was cut short due to shoulder surgery. But much like building a stronger frame, improving his endurance is something that a full pre-season can certainly help with at the elite level. There are plenty of good value talents in the draft crop and while he is not talked up as much as some others, Butters has some really exciting traits with plenty of room for improvement when in an elite environment. He has natural footballing talent combined with good athleticism, and while he is not a player that could be thrown in from Round 1, he is certainly one who could get games in the back-end of Year One, injury permitting, once he has adapted to the bigger bodies and improved his endurance. Expect him to be an eye-catching player with some serious X-factor.